Efforts are being made to increase engagement with Carrick’s historic town walls after a “significant minority” were said to be unaware of the structure. The finding was reported during a launch event for the completed Town Walls Feasibility Study last week. Established earlier this year, the study sought to explore public awareness and attitudes towards the walls. 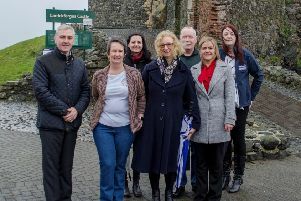 Carrickfergus Regeneration Partnership (CRP) was successful in securing funding to consider the town wall in terms of public accessibility, visitor friendliness, and tourism potential. The study would subsequently make recommendations for improvement and enhancement across all of these areas. The launch at Carrick Town Hall last Wednesday provided an opportunity to demonstrate the value of public feed back on the historic structure, which was first established around 1250 in order to protect the growing town surrounding the castle. Initially a defensive earth ditch and bank, the entirety of the walls were to be replaced in stone under Queen Elizabeth I, with work starting in 1608. By 1615, the completed stone walls were 1159 metres long and over six metres high with four gates, Irish Gate and North Gate – both of which had moats and drawbridges- Quay Gate and the smaller Water Gate. In addition to the gates, seven protective bastions were strategically positioned along the length of the walls. The feasibility study noted: “Our findings indicate that the majority of people are aware of the walls, of their historical significance and of their general location. The study has identified a range of short term, medium term and long term objectives for the town walls. Over the next 12 months, the issue of improved accessibility will be examined, with an aim of creating a year-round visitor facility by 2016. Medium term objectives include the creation of public spaces within the walls that will increase tourism potential and local engagement by 2018. A further objective includes the generation of employment opportunities through development expenditure on the walls by 2018, as well as labour market entry opportunities for those with no or low job skills and seasonal employment for students. In the long term, it is also hoped to further increase visitor numbers by approximately 50 percent by 2020.